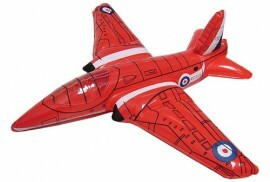 Inflatable Red Arrows Hawk - spacekids - space toys, dressing up costumes, kids spacesuits, astronaut food, cool space stuff! An inflatable version of the Red Arrows Hawk jet aeroplane. It is made of heavy duty vinyl and measures over 40cm long.